This is a campaign poster for Kathryn O'Loughlin, a Democrat, who ran for Congress from the Sixth District. Her political career included representing District 89 in the 1931 Kansas House of Representatives and the Sixth District in the 73rd Congress, 1933-35. 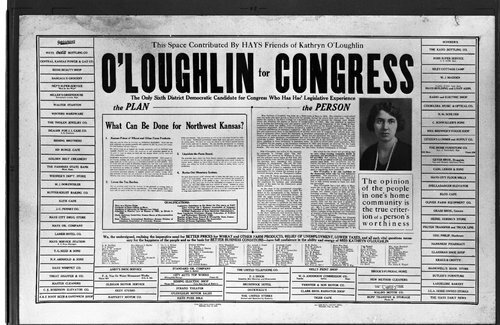 O'Loughlin who lived in Hays, Kansas, was the first Congresswoman from Kansas.